Team Arrow is losing one of its original members before its eighth and final season this fall. Arrow star Emily Bett Rickards announced Saturday that she will be leaving the superhero show at the end of the show’s seventh season. Rickards, who plays tech wizard Felicity Smoak, made the announcement on her Instagram account and hinted she was saying goodbye to the character after seven seasons. Reports state her contract is up after season seven and she has decided to move on from the show. The CW confirmed the news Saturday afternoon and show co-creator/executive producer Greg Berlanti and executive producer/showrunner Beth Schwartz said they are “heartbroken”, but wish Rickards well in the future. “We’ve had the pleasure of working with Emily since season one and in those past seven years, she has brought one of TV’s most beloved characters to life. And although we’re heartbroken to see both Emily and Felicity leave the show, we’re completely supportive of Emily and her future endeavors. She will always have a family at Arrow,” the pair said in a joint statement. The news shocked fans and has left everyone with questions about Felicity’s fate on screen. Considering she is in the flash-forwards, it seems likely that Rickards’ character may go into hiding to protect her family from the threats of Star City. Are you surprised Rickards is exiting the show? Let me know in the comments below! 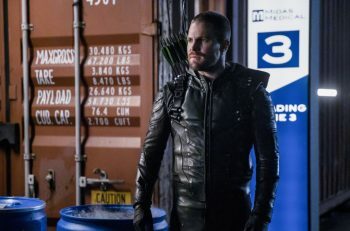 Arrow returns to The CW on April 15 in its new timeslot of 9/8c. ‘Arrow’ 7×16 recap: Mia and William track down Felicity in 2040 but where is Oliver?